When my essay “The Validity of the Witnesses' Testimonies” appeared in 2002 in American Apocrypha: Essays on the Book of Mormon,1 a close examination of the nature of the eleven Book of Mormon witnesses' experiences was long overdue. One purpose of my essay was to challenge the apologetic use of these testimonies, particularly the assumption that the experience of three witnesses was, in the words of emeritus Brigham Young University professor Richard L. Anderson, a “natural-supernatural appearance of the angel with the plates”2—in other words, it was an objective and physical visitation of an angel rather than a subjective and inward vision—and that the eight witnesses saw and handled the plates in a completely natural and a non-visionary manner. My investigation showed that subsequent statements by David Whitmer and Martin Harris made it clear that their experiences with the angel and plates were more subjective than their published group statement implied, and that the naturalistic-wording of the Testimony of Eight Witnesses is misleading. In the decade since publication of my essay, some Mormon apologists have attempted in various ways to dismiss it. The most serious response was published in 2005 by Richard L. Anderson titled “Attempts to Redefine the Experience of the Eight Witnesses,”3 which also critiqued Grant Palmer's handling of the same issue in his An Insider's View of Mormon Origins.4 Although I will respond mainly to Anderson's critique, I will also take this opportunity to respond to other apologists. Of course, the Testimony does not say the witnesses had an “unobstructed” view of the plates; that's Anderson's assumption. Nor does it say they turned the leaves, but instead ambiguously states that “as many of the leaves as the said Smith has translated we did handle with our hands.” Conceivably the leaves could be turned even while under a cloth or in a sack, which Anderson admits is possible when he states in a footnote “Martin [Harris] spoke of handling the leaves of the plates, but possibly when the record was covered, as William and Emma Smith did.”7 Regardless, since the Testimony can accommodate either Anderson's purely naturalistic reading or my spiritual-sight reading or even Palmer's purely subjective reading, it begs the question to quote the Testimony as contradicting the subjectivists' position. We saw how the naturalistic language of the Testimony of Three Witnesses led Anderson to make similar assumptions that were disproved by the subsequent statements of Harris and Whitmer, so Anderson is on shaky ground when he inserts his naturalistic assumptions into his reading of the Testimony of Eight Witnesses. Anderson tries to label the subjectivist interpretation of the Testimony of Eight Witnesses as mind reading, arguing that Palmer's position “is really based on knowing their ‘mind-set' instead of focusing on what they repeatedly said about their experience.”8 Anderson has long neglected an examination of the witnesses' lives in light of their pre-Mormon participation in early nineteenth-century visionary culture, which preconditioned them to Joseph Smith's claims and potential manipulations. His 1981 book Investigating the Book of Mormon Witnesses explores the lives and characters of the witnesses in great detail, but nothing is said about their propensities for visionary experience.9 Regardless, there is little difference in Palmer's contextualizing the Testimony within a visionary culture and Anderson's adding “unobstructed” and “turning the leaves” and assuming a detailed description of the plates precludes a visionary experience. Because the Testimony can be read from multiple perspectives, it is pointless for Anderson to reference instances of the witnesses reaffirming their published Testimony—it only begs the question. While Anderson makes it appear that there is no basis for Palmer's interpreting the Testimony from the perspective of early nineteenth-century visionary culture other than “discovering the inner workings of their minds,” this is simply not the case.10 Immediately preceding his conclusion that “the eight, like the three, saw and scrutinized the plates in a mind vision,”11 Palmer briefly discussed John Whitmer's reported statement that the plates had been shown to him “by a supernatural power” and Martin Harris's public announcement that he “never saw the plates with his natural eyes … & also that the eight witnesses never saw them [with their natural eyes].” Despite Anderson's subsequent apologetic dismissal of these sources, which will be examined below, Palmer's employment of them shows that his interpretation has little to do with mind reading and more to do with contextualizing the Testimony as it was understood by first-generation Mormons. It is therefore disingenuous to assert, as Anderson does in a footnote, that Palmer exhibits a “pattern of assuming the witnesses' ‘mind-set' without evidence.”12 Anderson and other apologists might disagree with Palmer's (or my) use of these two sources, but to say that the subjectivist interpretation rests on unfounded mind reading is just plain wrong. In typical apologetic form, Anderson wants to exploit my public statement that “there is simply no reliable proof for the existence of the supernatural.”13 To him, this means that analysis of the witnesses is inherently flawed by bias. In his words, “Reading Vogel on the Book of Mormon witnesses, therefore, is tracking a conclusion in search of evidence.”14 He says this apparently oblivious to his own bias. Of course, such a statement is an attempt at distraction since the bias of the arguer says nothing about the validity of the argument. And there is an additional problem with Anderson's accusation since it presupposes a chronology that is not supported by my biography. At what point in my journey from belief to disbelief did I become biased and my assessment of evidence infected by it? Against the second proposition, Anderson cites Lucy Smith's 1845 history as contradictory, stating she “refutes a split experience of seeing on one day and lifting the plates at an earlier time.”17 Indeed, Lucy said the men went into a grove near the Smith cabin and, she declared, “Here it was that those 8 witnesses recorded in the Book of Mormon looked upon the plates and handled them of which they bear witness in the following words …”18 However, it is unclear whether Lucy was stating what she remembered happened on that day, or was merely reflecting the content of the Testimony of Eight Witnesses, which she was introducing. Because Lucy gave no details of her own and relied on the published Testimony, we have no way of knowing if her memory and the Testimony were not one and the same. Anderson overstates the significance of this source when he argues that Lucy “insists that they ‘looked upon the plates and handled them' near her house on that day, an understanding gained from observation, conversation, and hearing the Eight Witnesses in the evening meeting when all >declared those facts that we knew to be true. '”19 Lucy did not “insist” anything, because she was unaware of our future debates, and her statement is not specific enough to support the kinds of assumptions Anderson tries to attach to it. Regardless, at most Anderson's use of Lucy Smith's statement might exclude the empty-box theory. Indeed, Lucy's statement only requires that the witnesses “handled” the plates on that day, which is fulfilled by the other possibilities listed. Anderson argues that “Ford's story traces to no reliable source and appears to be outright folklore.”24 However, he has difficulty explaining how Ford's “informants” knew about the subjectivity of the experience of the eight witnesses when there were no published sources making such claims in the 1840s. He tries to argue: “But slander circulating in one location is not proved true by similar slanders developed elsewhere, as the history of political campaigns shows.”25 Of course, labeling difficult testimony “slander” is also a ploy of political campaigns and hardly disproves the veracity of the testimony. Moreover, this depiction of the sources is highly inaccurate since neither John Whitmer nor Martin Harris, as believers, had an interest in slandering either themselves or the eight witnesses. The same can be said for Theodore Turley, a believer who undoubtedly had no motivation to misrepresent Whitmer's testimony. Stephen Burnett's reporting of Harris is also not “slander” since, as I will show, his account was reasonably accurate. Indeed, he had little motivation to slander, defame, or discredit Harris since he was using him as justification for dismissing the Testimony of Eight Witnesses. The key phrase is Whitmer's claim that the plates had been “shown to me by a supernatural power,” which I said “would suggest something other than a normal, physical experience.”27 Palmer similarly observed: “This added detail of how he saw indicates that the eight probably did not observe or feel the actual artifact.”28 Anderson counters this by arguing that “a strange ‘added detail' is a red flag,” and suggests Whitmer was “misquoted” since Turley's account “differs from all other John Whitmer accounts.”29 This claim is misleading since these other accounts are either simple affirmations or ambiguous statements that Whitmer had seen and handled the plates, which is not inconsistent with the subjectivist interpretation. “Many are brief and general,” Anderson admits, “but when details are given, they speak of seeing and/or handling as a normal event.”30 This is simply Anderson's assumption circulating through his reading of ambiguous sources in a question-begging fashion. Not only is this an example of the fallacy of proof by analogy,33 but Anderson is suppressing significant differences that make comparison less useful. The Davis account is an obvious error that is easily explained, but Turley's account is not so obvious and not so easily explained, although Anderson tries. The error in the Davis account might have something to do with the fact that it was written by the editor of the Deseret Evening News “a few days” after speaking with Davis, who had recounted an interview he had with Whitmer the previous month. So it is uncertain if the mistake is Davis's or the editor's. How well either of these men knew the content of the witnesses' Testimonies to prevent such error is unknown, but Turley was certainly in a better position to know the meaning of Whitmer's testimony, and there was ample opportunity to correct his report by knowledgeable reviewers if it had been mistaken. Although in the handwriting of Thomas Bullock, Turley was present giving the actual words that Bullock recorded. Although Turley's statement was emended and changed from first to third person by church historian Willard Richards, the statement about seeing the plates “by supernatural power” stood without correction and was copied by Bullock into Book C-1 of the Manuscript History in March 1845.34 This portion of Book C-1 was reviewed by George A. Smith and Heber C. Kimball on 19 August 1845,35 and although Kimball inserted additional reminiscences as Turley's fellow committee member and occasional companion, he apparently found nothing objectionable about Turley's report of Whitmer's testimony. Anderson also sees contradiction between Turley's report that the plates were shown to Whitmer “by a supernatural power,” and Whitmer's statement in his history that he was one of seven “to whom Joseph Smith Jr showed the plates.”36 However, this contradiction is only apparent and not real, because saying the plates were shown to him “by supernatural power” does not exclude the presence of Joseph Smith, who had brought the artifact into the grove. Both statements were true, and both were also incomplete. Another contradiction Anderson sees is Turley's statement to Whitmer: “you have published to the world that an angel did present those plates to Joseph Smith.” From this, Anderson supposes that Turley “erroneously thought the published statement of the Eight Witnesses testified of the miraculous,” and that it was this “preconception” that led Turley to insert the reference to “supernatural power.”37 However, Anderson's reasoning simply does not follow here. Testifying to the world that an angel delivered the plates to Joseph Smith says nothing about the nature of Whitmer's experience as one of the Eight Witnesses. Indeed, nothing in Turley's statement assigns the “miraculous” to Whitmer's testimony, and therefore there is no evidence of Turley's “preconception” or of his supposed “erroneous” understanding of the Testimony of Eight Witnesses. Turley's statement does not match the content of the Testimony, to be sure, but rather than assume Turley was so wildly mistaken (and that it escaped the notice of the reviewers) it is more likely that Turley was stating what the Testimony rhetorically meant to believing Mormons, not what it actually said. In other words, Whitmer's testimony was proof that Joseph Smith had indeed received plates from the angel as he claimed. Thus Anderson's apologetic against Turley's report is weak and his failure to include it makes his analysis of the witnesses incomplete. Burnett's account is supported by Warren Parrish, a fellow dissenter who was also present and heard Harris's statements. Parrish reported in August 1838 that “Harris, one of the subscribing witnesses, has come out at last, and says he never saw the plates, from which the book [of Mormon] purports to have been translated, except in vision, and he further says that any man who says he has seen them in any other way is a liar, Joseph [Smith] not excepted.”40 So there are two independent witnesses to Harris's public statements. Anderson attempts to diminish the importance of these two sources, describing Burnett's letter as “hostile and accusatory, adding distracting static to the line of information.”41 Hostile for Anderson apparently means that Burnett was a Mormon dissenter and skeptic, but this is nothing but circular reasoning since Burnett's disbelief was the result of what he had learned from Harris. Rather than supporting and lending credibility to Burnett's report, Anderson believes Parrish's account only “clarifies how disbelievers reinterpreted the witnesses' printed testimonies.” Thus Anderson attempts to explain away independent verification by speculating an interpretive conspiracy by the dissenters to misquote Harris in support of their own reinterpretation of the eight witnesses' testimonies. Of course, Anderson has no evidence for his ad hoc conspiracy theory and no reason to postulate one other than his need to explain away multiple witnesses. Anderson points to Parrish's “except in vision” and Burnett's “only in vision or imagination” as signs of “static” and “reinterpretation”. Of course, the wording reflects their own conclusions about what Harris had said, and obviously Harris would not have said “only” or “imagination”, but what historical source does not have the reporter's interpretation or conclusion? Neither was trying to provide a transcript of Harris's statement. However, these conclusions are easily separated from Harris's simple statement that the plates were never seen with the natural eye by either the three or eight witnesses. Because Parrish and Burnett personalized what Harris had said does not render their account unreliable. 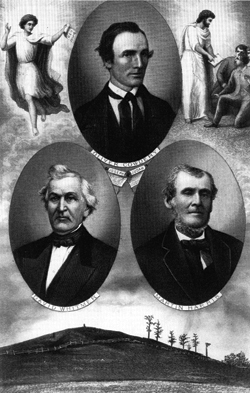 Anderson tries to suggest that Parrish and Burnett were influenced in their fabrication of Harris's public confession by E. D. Howe's 1834 publication of apostate Ezra Booth's 1831 conclusion that the three witnesses had seen the angel and plates “by faith or imagination.”42 Booth had based this conclusion on the same June 1829 revelation cited by Harris (D&C 17), which remained unpublished until 1835. The revelation promised the three witnesses a view of the plates by “faith” and by the “gift” and “power” of God, and instructed them to testify to the world that they had seen the plates “with their eyes … even as my servant Joseph Smith, Jun., has seen them; for it is by my power that he has seen them, and it is because he had faith” (D&C 17:5). As Booth summarized the unpublished revelation, the witnesses “were informed that they should see and hear those things by faith, and then they should testify to the world, as though they had seen and heard, as I see a man, and hear his voice,”43 which we know from subsequent statements was not the case. So when Anderson reads the published Testimony of Three Witnesses as describing a “natural-supernatural” experience, or argues that “if Harris used the word vision to describe the Three Witnesses' experience, he would have meant there was a real visit of an angel,” he is being led by a document that was intentionally worded to give the wrong impression. Indeed, the revelation can be read two ways. It could mean either that both Joseph Smith and the witnesses saw the plates with their natural eyes or they both saw them in vision. In other words, Harris's conclusion about Joseph Smith was based on what was true about himself, and since his experience was subjective and visionary, so was Smith's. Subsequent statements by Martin Harris and David Whitmer contradict Anderson's naturalistic reading of the published Testimony and support Parrish's and Burnett's reporting of Harris. Anderson glides over the fact that it was Harris, not Parrish, who referenced the revelation in his 1838 discussion. Anderson asserts that it was Parrish who drew on it “to show that faith was required to see the plates, which proved to Parrish that preconditioning produced a religious delusion.”44 However, Parrish was only supplying the implied source for Harris's statement, and that it was Harris who said “any man who says he has seen them in any other way is a liar, Joseph not excepted; see new edition, Book of Covenants, page 170, which agrees with Harris's testimony.” Booth had applied the revelation to the three witnesses only, but Harris alluded to it as a principle that also applied to the eight witnesses and Joseph Smith. Burnett does not explicitly say Harris referenced the revelation, but the wording of his letter strongly implies it. “Martin admits that there can be nothing brought to prove that any such thing ever existed,” writes Burnett, “for it is said on the 171 page of the book of covenants that the three [witnesses] should testify that they had seen the plates even as J[oseph] S[mith] Jr & if they saw them spiritually or in vision with their eyes shut—J[oseph] S[mith] Jr never saw them any other light way & if so the plates were only visionary.” Of course, this statement is couched in rhetorical language and deals with the implications of Harris's statement, rather than his actual words. However, Burnett's claim that Harris admitted that there was no visual evidence that the plates existed implies his use of the revelation for justification just as Parrish reported. Anderson's conclusion that Howe's 1834 publication of Booth's letter provided “a promptbook for Burnett and Parrish interpreting Harris in 1838” is therefore ad hoc speculation and ultimately irrelevant since the revelation was used in completely different ways. Anderson's next line of argument is to reinterpret Burnett's account of Harris's second statement as a complaint that he had been misquoted about the eight witnesses and that despite this complaint Burnett persisted in misrepresenting Harris. Responding to my observation that Harris was a reliable source because he knew the eight witnesses and their testimony well, Anderson argues that the “real question is whether Burnett quoted Harris accurately. The answer is that Burnett continued to believe in a visionary experience for the Eight Witnesses even after Harris said he had given the wrong impression on that issue.”45 Of course, Burnett did not confess to doing this—not even a hint. Again, Anderson indulges in ad hoc speculation when he tries to replace Burnett's report with what he thinks Harris really said at the second meeting. The result is an eisegetic and idiosyncratic interpretation of Burnett's words with a heavy infusion of Anderson's own bias. As also discussed in my essay, “spiritual eyes” was a term used by other mystics to designate seeing things invisible to the natural eyes. Despite his own beliefs, Harris was well aware that the distinction between spiritual eyes and natural eyes opened the door to skepticism—a door he could have closed by mentioning the completely natural and physical experience of the eight witnesses, but he left that door open as well, which speaks to his integrity as a witness. To interpret Harris's words as Burnett did is not in itself evidence of bias. Burnett was a troubled believer who was pushed over the edge by what he heard Harris say. Labeling unfavorable testimony as biased simply because it is unfavorable is circular; it is Anderson's way of immunizing his position against negative evidence. Another of Burnett's comments that Anderson believes shows bias is his conclusion that “if they [the witnesses] saw them [plates] spiritually or in vision with their eyes shut … the plates were only visionary.”48 Anderson calls this an “interpretive paraphrase” and complains that “there is no parallel for the witnesses equating seeing ‘in vision' with having ‘their eyes shut. '”49 This may be true, but if this is Burnett's “interpretive paraphrase” it means that the three witnesses' experience was inward and subjective and not external and objective or—to use Anderson's interpretive paraphrase—a “natural-supernatural” event. The problem for Anderson is that his paraphrase is based on a superficial reading of the published Testimony, which is not supported by the subsequent clarifying statements of Harris and Whitmer—which were quoted in my essay but Anderson neglected to discuss. David Whitmer, for example, was interviewed in 1885 by returning Mormon missionary James Henry Moyle, who recorded in his journal that the witness said the vision “was indiscribable that it was through the power of God. … he then spoke of Paul hearing and seeing Christ but his associates did not. Because it is only seen in the Spirit.” Moyle “asked if the atmosphere about them was normal.” In other words, did the angel appear in normal surroundings, as Anderson's interpretation would predict, or had the vision entirely obscured the natural world? According to Whitmer, “it was indescribable, but the light was bright and clear, yet apparently a different kind of light, something of a soft haze.” Moyle noted his disappointment: “I was not fully satisfied with the explanation. It was more spiritual than I anticipated.”50 Moyle's anticipation for a different answer from Whitmer was likely based on his reading of the published Testimony, which means that Anderson is using a faulty gauge for accusing Burnett of bias. Evidence therefore supports Burnett's reporting of Harris's first public statement about the three witnesses, and his reasonable conclusions based on what he heard Harris say are easily separated. Despite this, Anderson feels justified in creating a fiction that Burnett's report of Harris's second statement is masking the fact that the witness was “protesting he was misunderstood” and his “words were misused” by the dissenters.51 This is pure fantasy. Harris had evidently told the dissenters what he had told John A. Clark in 1828, that he saw the plates “with the eye of faith Y just as distinctly as I see any thing around me,—though at the time they were covered over with a cloth.”56 The weakness of such evidence even in Harris's mind is revealed by his own actions following his meeting with Clark. In March 1829, Harris showed up at Joseph Smith's door in Harmony, Pennsylvania, demanding to see the plates. Isaac Hale remembered: “Martin Harris informed me that he must have a greater witness, and said that he had talked with Joseph about it.”57 At this time, Smith dictated a revelation: “Behold, I say unto you, that my servant Martin has desired a witness from my hand, that my servant Joseph has got the things of which he has testified, and borne record that he has received of me.”58 Harris told Isaac Hale that “Joseph informed him that he could not, or durst not show him the plates, but that he (Joseph) would go into the woods where the book of plates was, and that after he came back, Harris should follow his tracks in the snow, and find the book, and examine it for himself.” Hale said that “Harris informed me afterwards, that he followed Smith's directions, [but] could not find the plates, and [that he] was still dissatisfied.”59 Three months later, Harris would receive his “greater witness” by becoming one of the three witnesses, but he never saw the plates uncovered with his natural eyes. Given Harris's own attitude about his pre-vision experience with the plates, he could hardly blame the dissenters for being unmoved by such stories. If Harris believed his lifting of the plates in a box or handling them in a cloth contradicted the dissenter position, he was mistaken judging by Burnett's lack of concern. Anderson interprets this as stubbornness, but it more likely indicates that Harris misunderstood their position. Burnett does not give a theory as to what was in the box or under the cloth, but emphasized that Harris had not seen it. So it was not Harris who “straightened out” Burnett and the other dissenters, but it was Burnett who corrected Harris in his letter, if not in person. Anderson adds speculation to speculation, asserting that Harris “modified his initial comments on the Eight Witnesses,” although nothing in Burnett's report changed what Harris had said before. Harris's complaint that he would not have revealed the true nature of the eight witnesses' experience “if it had not been picked out him” is interpreted by Anderson to mean that Harris had made the statement “under pressure” and that he was “confused by leading questions” and did not mean to say that the eight witnesses had not seen the plates with their natural eyes or that they had hesitated to sign the published Testimony.62 “If we compensate for Burnett's loaded language,” argues Anderson, “Harris's retraction was essentially this: he never would have agreed that the Eight Witnesses saw the plates through spiritual sight if he had not been confused by leading questions, but would have let their written testimony speak for itself.”63 Compensating for Burnett's bias requires little more than removing his conclusion that visions are equivalent to imagination, which Harris obviously did not believe. There is therefore no justification for Anderson's fantasy reconstruction, which flatly contradicts Burnett's account and is nothing more than his own biased ad hoc insertion into the story. There is also no justification for Anderson's assertion that “Burnett continued to believe in a visionary experience for the Eight Witnesses even after Harris said he had given the wrong impression on the issue.”64 To conclude Burnett was “stubborn” we must first conclude Harris said something other than what Burnett reported, and there is simply no evidence for that. Anderson believes the subsequent statements by some of the eight witnesses affirming that they had handled and seen the plates contradict my thesis. Except for one late interview with John Whitmer, discussed below, these statements are simple affirmations and lack the detail Anderson needs to establish his point. John Whitmer's 1836 statement, for example, that “I have most assuredly seen the plates … and that I have handled these plates,”65 neither affirms Anderson's reconstruction nor contradicts my theory. Simply, Whitmer could make this statement having handled the plates in a cloth while seeing them in vision. Anderson responds to my statement that “specific declarations by the witnesses about handling the plates are few and vague”66 by calling it “disturbing” and arguing that the “9 references to handling the plates are more than a few. Nor is the word handling vague.”67 Of course, “few” is in contrast to the many statements by Harris and Whitmer of their experience; and “vague” is in reference to the lack of detail about the actual manner of their having handled and seen the plates. Anderson overstates what can be learned from these vague and ambiguous sources when he argues that “the Eight Witnesses speak of unlimited direct contact, not a vision of the plates with previous experiences of lifting them when covered.”68 Obviously, simple affirmations of seeing and handling the plates neither supports Anderson's description nor contradicts my theory. Anderson again tries to argue against my observation that handling and seeing the plates are not necessarily the same experience. I have suggested that the witnesses handled the covered plates but saw them with spiritual eyes, as Harris revealed. If the plates were presented to the group in a box as Ford's informants claimed, then the handling and lifting of the leaves may have reference to prior experience with the covered plates, although technically they still handled the plates in the box as a group. However, if the plates were presented in a sack or some kind of cloth covering, then the whole experience could have happened at once. Anderson cites Lucy Smith and David Whitmer as evidence that the handling and seeing happened on the same day. As previously discussed, Lucy's 1845 statement is problematic and is not a specific memory of what was said by the witnesses on the day Joseph Smith showed them the plates. Likewise, Whitmer's statement is unable to resolve the issue at hand. Anderson quotes Whitmer's off-handed comment that “the eight witnesses saw them [plates], I think, the next day or the day after” the three witnesses saw them as proof that he believed “the experience of the Eight Witnesses [w]as an event on a given date.”69 Regardless, my theory does not deny that the eight men accompanied Joseph Smith into a grove near the Smith cabin where they saw and handled the plates. Only the exact method Joseph Smith employed and the precise nature of the eight witnesses' experience on that day and how the published Testimony relates to it are at issue. Similarly, the Testimony of Three Witnesses makes it sound like a single event, whereas subsequent statements revealed that Harris had a separate vision of the angel and plates. Hyrum may have responded to Harris's public statements about the eight witnesses when he visited Sunbury, Ohio, in April or May 1838 and reportedly said that “he had but too [two] hands and too [two] eyes[.] he said he had seene the plates with his eyes and handeled them with his hands.”70 Anderson quotes this source in his book and again in his response to me and Palmer, apparently without realizing that Hyrum's statement confirms Burnett's reporting of Harris. Rather than denying he had seen the plates with “spiritual eyes,” Hyrum obfuscated by saying he had only two eyes—which was not a denial of a visionary experience. In my essay, I compared Hyrum's remark to a similar statement David Whitmer made in 1886: “I have been asked if we saw those things with our natural eyes. Of course they were our natural eyes. There is no doubt that our eyes were prepared for the sight, but they were our natural eyes nevertheless.”71 Neither Whitmer nor Hyrum were denying the visionary nature of their experiences, only quibbling about the terminology being used and the implication that it was imaginary. I—Did you see them covered with a cloth? Where did Poulson hear that the witnesses had seen the plates covered? Burnett's letter was unknown to him. Possibly he spoke to Harris, but more likely he heard it from John Whitmer—the witness who, according to Theodore Turley, said that the plates were shown to him by “a supernatural power.” Poulson likely changed Whitmer's statement to read the opposite of what he said during the interview, and there is good reason for believing this. Unfortunately, John Whitmer was dead when Poulson's account was published and could not challenge the accuracy of the reported interview. However, Poulson's subsequent publication of his interview with David Whitmer was challenged by the interviewee as containing invented conversation. In a letter to S. T. Mouch, 18 November 1882, David Whitmer complained about Poulson's account of the interview: “As to what you Say about the correspondence published by P Wilhelm Poulson M D Aug[ust] 20th 1878. I surely did not make the Statement which you Say he reports me to have made, for it is not according to the facts. And I have always in the fear of God, tried to give a true statement to the best of my recollection in regard to all matters which I have attempted to Explain. And I do not now remember of talking to Mr Poulson on the subject referred to.”73 Unfortunately, we do not know what portion of the interview Whitmer referred to since we do not have Mouch's letter of inquiry. That there was an inaccuracy suggests that Poulson probably did not keep careful notes during his interviews. At the end of the present account, Poulson states that his conversation “was mostly written down word for word half an hour after the interview.”74 “Mostly” suggests that in some instances it may have gone beyond his notes and drew from memory about four months later. Anderson tries to minimize this problem by arguing that Whitmer “corrected one issue in a report consisting of answers to 20 questions,”75 but he was responding to the one question asked of him by Mouch. This does not imply that Whitmer had no other objections. Anderson further argues “about two-thirds of what David reportedly said is corroborated by what he said in other published interviews (most of the other third being new material that cannot be compared for consistency), so Poulson's report of his interview with John Whitmer likely reflected a similarly high degree of accuracy.”76 However, the inaccurate part in David's interview happens to be the most significant portion, and the parts of John's interview that can be shown to be inaccurate are likewise major. He [Harris] was not by us at all when we first saw the angel. First when we told him what we had seen, and were the second time in prayer all together, and when the angel appeared for a second time, we saw Martin Harris by us, and he saw, and we saw it, and our testimony, which we give to the world, is true exactly as you read it. I—In what place did you see the plates. I—Were you all eight witnesses present at the same time? He—No. At that time Joseph showed the plates to us, we were four persons, present in the room, and at another time he showed them to four persons more. Of course, this flatly contradicts Lucy Smith's account of the men leaving her in the cabin and going to a nearby grove and returning. Anderson admits these are “problematic answers,” but argues that they are “minor” and offers ad hoc explanations that “John Whitmer possibly said something like ‘at Joseph Smith's house,' meaning to him that the Eight Witnesses viewed the plates on that property. … Perhaps John Whitmer originally said that the Eight Witnesses were composed mainly of two groups, meaning the four Whitmer brothers and the three Smiths, with Hiram Page not included in the general comment. Two sets of witnesses might have been mistaken for two separate viewings of the plates.”78 And thus we see, once again, Anderson resorting to ad hoc speculations to escape adverse evidence. Whatever the reason, if Poulson can be that far off on the circumstances of the witnesses viewing the plates, how can he be trusted about other unique elements in his account? Despite Anderson's apologetic, these are not “minor” details. Poulson's biography does not support his being a truthful reporter when his self-interest is involved. Anderson tries to minimize this fact—“Though Poulson became an eccentric and fictionalized his background, his ability as a reporter is the main issue in evaluating his interviews with David and John Whitmer.”79 Really? What does Poulson have to do to make Anderson skeptical of his ability as a reporter? Here we have an explanation for the fictional elements that appear in his interviews with David and John Whitmer that appear nowhere else and are contradicted by more reliable sources. Anderson takes issue with my statement that “[i]ndividual statements by the eight witnesses are rare due largely to their early deaths.”80 He argues that “rare is inaccurate” since I also list “17 times when one of the Eight Witnesses explained or validated his published testimony or when family members said he was always faithful to it.”81 However, the context of my statement was accounts containing “[d]etails of what transpired in the Smith grove” and “the historical event behind their Testimony.” At the conclusion of my list, I clearly state: “As can be seen, except for Poulson's late interview with John Whitmer, specific declarations by the witnesses about handling the plates are few and vague.” This is in contrast with the statements of David Whitmer and Martin Harris about their experience with the plates, both of whom were interviewed many times in their later years. Anderson, who is a very good collector of sources himself, then quotes a few third hand sources not included in my compilation and claims that he “can document over 40 instances when one of the Eight Witnesses restated his testimony, with the printed declaration of that testimony mentioned or understood in the statement or conversation”82—none of which changes my description that the majority of surviving statements by the eight witnesses are vague and lack historical detail. To cite instances of the eight witnesses affirming their published testimony only begs the question, for it is not the same as affirming Anderson's interpretation of the Testimony. Context changes how one reads the Testimony, and without additional information from Burnett's report of Harris and Turley's report of John Whitmer, one might be led to a naturalistic interpretation. But this additional information changes the context in which both the Testimony and subsequent affirmations are to be read. The same is true for the Testimony of Three Witnesses, which led Anderson to incorrectly conclude it was based on a “natural-supernatural appearance of the angel with the plates.” Moyle had the same assumption, but was surprised to learn that “[i]t was more spiritual than I anticipated.” Yet, Whitmer said that “our testimony as recorded in the Book of Mormon is strictly and absolutely true just as it is there written.”83 Obviously, the Testimony is ambiguous enough to accommodate more than one interpretation. So when David Whitmer affirmed the truth of the published Testimony, he was not affirming Anderson's assumption that it was based on a “natural-supernatural” experience. To read it that way would be begging the question, or assuming what one is attempting to prove. The same is true for Anderson's assumptions about the Testimony of Eight Witnesses, particularly his concluding argument: “Judged by the agreement of 40 other interviews of the Eight Witnesses, the historian should conclude that Turley misquoted John Whitmer on a miraculous viewing of the plates.”84 The fact that these “other interviews” are ambiguous, either containing a generic statement of seeing and handling the plates or affirming the published Testimony, and in no way contradict Turley's reporting of John Whitmer, means that Anderson's argument assumes what he is trying to prove. Turley's account was reviewed by several knowledgeable early Mormon authorities and historians without correction, and is supported by Burnett's report of Harris as well as the implications of D&C 17 and cannot be discarded based on Anderson's question-begging assumption—no matter how many times he does it. To assume the original Testimony describes a “material event”—that is, the presence of the uncovered plates—is to beg the question since the testimony does not explicitly state that the plates were uncovered, only that they were seen and handled by the witnesses. This in no way precludes the details provided by Turley's interview with John Whitmer and Burnett's report of Harris, and therefore no amount of “simple reaffirmations” substantiate a biased reading of the original Testimony. Anderson's argument also rests on a false dichotomy of physical versus subjective, and ignores the fact that the Ohio dissenters as well as some current interpreters combine physical handling with subjective sight. Thus Anderson is mistaken when he says: “Although current critics claim a conflict between later sources and the original published testimony, its accuracy is the stated or implied theme of all interviews with the Eight Witnesses.”86 It has been stated that the Testimony is misleading, not inaccurate. The Turley and Burnett reports did not contradict the published Testimony, but added detail that clarified the historical setting behind the statement. In an ad hominal argument, Anderson tries to use my and Palmer's words against us: “Finally, advocates of a group illusion for the Eight Witnesses admit that the original declaration ‘seems to describe a literal event,' and its language ‘implies a natural, physical experience. '”87 Of course, we also believe the ambiguous language of the original testimonies was intentional, which explains why, as Harris reported, the eight “hesitated to sign that instrument” and why their statements were brief and vague. It also explains why Harris (and by implication all three witnesses) was specifically instructed to say: “I have seen the things which the Lord hath shown unto Joseph Smith, Jun., and I know of a surety that they are true, for I have seen them, for they have been shown unto me by the power of God and not of man. And I the Lord command him, my servant Martin Harris, that he shall say no more unto them concerning these things” (D&C 5:25-26).88 Fortunately for historians Harris did not strictly adhere to this commandment and he and David Whitmer supplied details to correct our assumptions and incomplete reading of their Testimony. The same is apparently true for the Testimony of Eight Witnesses by our best interpretation of the evidence. Anderson argues that my and Palmer's use of seems and implies should be deleted from our descriptions of the Testimony of Eight Witnesses because “[n]o evidence to the contrary can be shown to come from the witnesses themselves.”89 Anderson, who freely uses the reminiscent accounts of the witnesses' relatives as well as Poulson's problematic interview, wants to exclude Burnett's and Parrish's report of Harris and Turley's report of John Whitmer because they are secondhand. Mormon apologists typically try to exclude undesirable sources because they are secondhand testimony, but as Louis Gottschalk's well-known historical primer explains, hearsay evidence or testimony from interested witnesses is not automatically excluded provided it can be demonstrated to come from a credible source.90 Turley, Parrish, and Burnett have been shown to be reliable reporters through independent verification, while Poulson was demonstrably unreliable, and the reminiscent accounts were shown to be irrelevant. Even firsthand statements were too vague to establish Anderson's assumptions. In a journal for the LDS Church education system called the Religious Educator, Steven C. Harper, an associate professor of Church history and doctrine at Brigham Young University and an editor with the Joseph Smith Papers project, published a response to my essay in American Apocrypha, but conflated and confused it with Palmer's interpretation. “But some have questioned the nature of the witnesses' experiences, arguing that they were supernatural and visionary,” Harper begins. After citing my essay in an endnote, he continues: “The witnesses, this argument asserts, did not see or touch ancient artifacts as we see or handle trees or chairs but only through unreliably subjective ‘spiritual eyes,' rending their statements null and void.”91 “Null and void” is not the conclusion I reached, but that the testimonies of both the three and eight witnesses were based on visionary experiences and therefore should be approached with the same skepticism that accompanies any religious testimony or claim. Harper also misses the point when he states that his purpose is to argue against the “assumption that seeing with spiritual eyes negates one's witness,” which is a position that neither I nor Palmer articulated. Knowing the experiences of both the three and eight witnesses were visionary changes how one views those experiences, but it does not automatically negate them. The lack of historical verification for the Book of Mormon as well as historical and literary anachronisms brings the reality of their experiences into doubt. No Nephites, no plates. Harper also fails to distinguish between Palmer's position, which argues that “the [eight] witnesses seem to have seen the records with their spiritual eyes and inspected them in the context of a vision apparently never having actually possessed or touched them,”92 and my theory, which combines the physical “hefting” of fake plates concealed in a box or cloth covering with visionary sight. Harper's methodology is no better than Anderson's, repeating many of the same mistakes. He mentions, for example, the “hearsay” accounts of Martin Harris saying he saw the angel and plates with “spiritual eyes,” without mentioning the element of independent corroboration, and uses the same question-begging approach that Anderson used, quoting firsthand statements of Harris and Whitmer affirming they had seen the angel and plates. Harper attempts to portray all secondhand reports as biased: “These statements are most valuable of how a variety of people have chosen to interpret and respond to the Book of Mormon witnesses.” All reports are merely interpretations based on interest? But, as we have seen with Moyle, that is simply not the case. Historians deal with biased testimony all the time. One way around bias is independent corroboration, another is testimony given by a reporter that is not favorable to his own position. As my previous quote from Gottschalk's historical primer shows, it is not standard historical methodology to dismiss out-of-hand secondhand testimony as Harper implies. Harper says he writes “as an historian who chooses to believe in the testimonies of the Book of Mormon witnesses” and wants to extend “an invitation to my readers to join me in making that informed choice.”94 But this is not what the discussion is about. It is not a matter of belief vs. disbelief, but rather of what kind of testimony he is choosing to believe. Neither Palmer nor I have accused the witnesses of lying, although the published Testimonies of both sets of witnesses are misleading. What Harper should worry about is whether his belief is based on a true or false historical understanding of the experiences of the eleven witnesses. If he wants his readers to join him in making an “informed choice,” he should make sure that it is a correctly informed choice? But, alas, it is not. Harper's promise of “informed choice” quickly evaporates when he makes the simplest of errors, claiming that “Joseph Smith's history is the primary historical source that tells how Y eight other men gathered to see and heft the plates themselves.”95 However, Smith's history merely reproduces the Testimony of Eight Witnesses without any explanation as to how it was obtained. He then quotes the simple firsthand affirmations of Hyrum Smith, Hiram Page, and John Whitmer, that they had seen and handled the plates. Thus, using these question-begging quotes, he knocks down a straw man by making it appear that the critics have ignored this evidence. Harper then moves to “hearsay evidence”. He begins by giving a lecture about the problems associated with such evidence, but this lesson is incomplete as he fails to explain how historians decide which is more credible than others. He argues that hearsay “is, by nature, unverifiable,” without mentioning the possibility of independent corroboration. He attempts to throw them into one category and label them as “inconsistent,” thereby dismissing the entire category of secondhand testimony. “What witnesses reportedly said in one account differs from the next. … People trying to reconstruct from hearsay what the witnesses saw will end up frustrated. … It is not reliable for reconstructing their experiences.” Lumping all secondhand and hearsay testimony together as hopelessly contradictory and favoring the official account are a typical apologetic maneuvers, but it's not standard historical methodology. As Gottschalk states: “The historian Y uses primary (that is, eyewitness) testimony whenever he can. When he can find no primary witness, he uses the best secondary witness available. … Thus hearsay evidence would not be discarded by the historian.”96 This is just such an instance where the primary testimony is inadequate to answer our questions. Historians are justified in drawing on this secondary testimony, provided they are mindful of credibility, independence, and corroboration. I believe Harper's complaint about hearsay is disingenuous since I doubt he would raise the same objection when historians draw on them for less controversial elements. It is only from these secondary sources, for example, that we learn that the three witnesses in addition to seeing the angel and plates also saw a table with other relics on it, such as the Urim and Thummim, brass plates, Liahona, and sword of Laban, in fulfillment of the promise of the June 1829 revelation (D&C 17). Historians who have included this element in their reconstructions are justified because it was reported by competent interviewers of David Whitmer and Martin Harris on more than one occasion.97 The same is true for the eight witnesses seeing the plates spiritually. As discussed above the dissenters in Ohio did not elaborate a theory as to what Harris and the eight witnesses “hefted” in the box or wrapped in a cloth; they were mainly concerned that no one had actually seen the object uncovered. That Joseph Smith had a metallic book of some kind seems probable based on the available testimony. Even antagonist Isaac Hale reported, “I was allowed to feel the weight of the box, and they gave me to understand, that the book of plates was then in the box—into which, however, I was not allowed to look.”98 Harris reported that when Alvah Beman put the box of plates into a barrel of beans for transport to Harmony “he said he heard them jink.”99 Emma Smith examined the bundle of plates through the cloth and remembered that they would “rustle with a metalic sound when the edges were moved by the thumb, as one does sometimes thumb the edges of a book.”100 William Smith said the plates “weighed about sixty pounds according to the best of my judgment.”101 Martin Harris said he hefted the plates many times and estimated that the plates “weighed forty or fifty pounds.”102 From this, the unavoidable conclusion is: Joseph Smith either had in his possession authentically ancient plates or he had a fake set of plates of his own construction. First, I did not contradict my theory with a “throwaway line at the end of [my] essay”; it was an integral element in my theory all along. My examination of the experience of the eight witnesses was centered on a resolution of the problem of physically handling the plates while seeing them spiritually. The line at the end about the ability of Smith to make plates and its accompanying footnote calculating the weight of tin plates merely expressed in detail what was implied in the previous discussion. Peterson's critique, therefore, is not of my essay but a straw man of his own imagination and lack of attention to detail. Second, Peterson creates another straw man argument by making the construction of the plates as difficult as possible. Although in my essay I did not go into detail about how Smith could make a set of plates out of a tin sheet, Peterson could have read the elaboration of this point in my biography, which he elsewhere quotes in his essay.107 It is entirely reasonable to suggest Smith had the ability to make a set of fake plates, as the subsequent examples of James Strang's plates as well as the Kinderhook plates demonstrate, the former of which Peterson has publically discussed. Despite the irrelevance and absurdity of this line of argument, Peterson continues to repeat it in discussions on the internet, specifically the Mormon Dialogue and Discussion Board, although I have corrected him numerous times. Apparently, Peterson is unaware that his theory that the box or cloth concealed a genuinely ancient artifact is also ad hoc—by his own definition—because no one saw the plates uncovered in a non-visionary situation. Given the fact that Joseph Smith deliberately withheld this information, there is no documentation for either theory. But that's my point. Contrary to apologetic assumptions, the door is open for more skeptical interpretations that are consistent with a non-historical Book of Mormon. Previously in the same essay, Peterson had acknowledged the need for explaining the origin of the object Joseph Smith presented to the witnesses and others: “If the plates really existed, somebody made them. And if no Nephites existed to make them, then either Joseph Smith, or God, or somebody else seems to have engaged in simple fraud. The testimony of the witnesses exists, I think, to force a dichotomous choice: true or false?”110 If an answer to this question is unavoidable, on what basis does he privilege his speculation and categorically exclude others? The simplest answer—the least ad hoc—is that Joseph Smith concealed the plates from view because they were made out of tin and could not pass visual inspection. Otherwise, the ban on visual inspection is highly suspicious and makes no sense. Moreover, tin was plentiful in Smith's immediate environment and consistent with the reported weight. On the other hand, because gold is too heavy, Peterson is forced to make further “ad hoc” speculations about the metallic composition of the plates to avoid evidence that challenges his position.111 Ultimately, Peterson's characterization of my position as an example of an ad hoc escape from negative evidence is flawed since my discussion of the nature of the eleven witnesses' experiences is documented and the existence of an object that no one sees is hardly a challenge to my conclusion that there were no Nephites. Contrary to Peterson's assertion, there is nothing inherently wrong with supplying an explanation of the plates that is consistent with a non-historical Book of Mormon. Bushman's suggestion that there is only one “documented narrative” is simply untrue. By his own admission some of Smith's contemporaries “speculated” that something other than real gold plates were under the cloth. That those who “knew Joseph best” chose to believe him doesn't make their position any less speculative than other contemporaries. Of course, the Smiths had more accurate information about the object under the cloth than outsiders and knew the tile-under-the-cloth theory and sand-in-the-box theory were untrue. Regardless, the possibility that Joseph Smith could have made a set of fake plates is also part of the “documented narrative.” This would be true even if non-believers had not suggested it, as demonstrated by Martin Harris seeking a “greater witness,” although he had hefted the plates in the cloth many times. There would be no reason to believe, if there were not also a reason for skepticism. Because the plates were covered, the statements of Smith's family and friends are only evidence of their trust. Nothing more. They concluded Joseph was telling the truth because they could feel the plates and rings through the cloth and could hear a metallic sound when they ruffled the pages. But that is where their testimony ends. While their testimonies can be used to dismiss specific speculations—that the box contained sand or the cloth concealed a brick tile, for instance—they cannot be used to eliminate speculation altogether because they are themselves speculations. Moreover, Bushman should have recognized that my discussion of the plates did not begin with a wild speculation about how Joseph Smith could have made them out of tin, but rather, as explained in my introduction, with the assumption that the Book of Mormon is not real history. Thus, to the extent that one believes the evidence points to a non-historical Book of Mormon, it also points to something other than real gold plates under the cloth. The two are inseparably connected. Bushman's attempt to straitjacket historians with a one-sided narrative that serves the believer's agenda should be rejected. It is one thing to narrate the story from the believers' point of view, as Bushman does, but quite another to proscribe other historians from exploring other aspects of the story. The fact is that Smith, by concealing the plates as he did, invited speculation. It is a part of the story that cannot be ignored. In his 2004 critique of American Apocrypha, Alan Goff failed to discuss the specifics of my essay—whether or not the three and eight witnesses viewed the plates subjectively and the possibility that they hallucinated—but instead attempted to derail the discussion with an esoteric and irrelevant discussion about epistemology, using a postmodern critique of knowledge as an apologetic against a position I did not take. Indeed, it is Goff's extreme anti-positivist stance and lack of familiarity with the sources and subject that cause him to distort my arguments. The connection Goff makes between my argument and positivism as he defines it is loose and his understanding of my argument is incomplete and amounts to a straw man. My goal here was not to argue that visionary experiences are automatically discounted, as Goff asserts, but to controvert Richard Anderson's superficial reading of the published Testimony (that the three witnesses' experience was a “natural-supernatural appearance” of the angel and plates, that the angel was literally, physically, and objectively present) by bringing into the discussion the subsequent statements of Whitmer and Harris, which make it clear that it was spiritual, supernatural, and subjective. Thus the discussion was about the nature of the three witnesses' experience, not about the nature of reality. Goff conveniently ignores this context and tries to force the discussion into a path he understands better. If my discussion stresses the non-physical subjective nature of the witnesses' experience, it's not necessarily because I'm a positivist, naturalist, empiricist, or naive realist, but because apologists have presented the published Testimonies as empirical evidence for the existence of the gold plates. Goff follows this misinterpretation with another: “Vogel conflates visions with hallucinations to make the straightforward assertion that visionary experiences do not amount to historical evidence.” Of course, to count visionary experiences as historical evidence one would have to decide that visionary experiences were real, as opposed to hallucination or deception. However, that was not the context of what I was discussing. To support his assertion that I reject visions as historical evidence, Goff quotes my statement: “The real question is not the trustworthiness of the witnesses but whether testimony resulting from visions or hallucinations is reliable.”115 This statement was in response to Anderson's argument that the vision of the angel and plates was real because the witnesses were honest, intelligent, God-fearing people. Anderson's argument indicates that he, like Goff, has a blind spot for the possibility of hallucination. We know humans hallucinate; we don't know that they have extrasensory experiences with real angels and plates. Before we treat visions as historical evidence, Goff needs to tell us how to distinguish hallucination from a real vision, or at least acknowledge the ambiguous nature of such evidence. While I have been forthright about my naturalistic bias, it is not necessary to resolve the naturalism/supernaturalism debate to make an assessment of Mormon testimony. Even if supernaturalism is a legitimate worldview that does not mean that every claim of it is true. Again, the purpose of my essay was not to automatically discount visions as hallucinations; it was less ambitious. My aim was to dismantle the apologetic of some Mormon scholars who believe the testimony of the three and eight witnesses prove Joseph Smith possessed real anciently engraved gold plates. However, evidence indicates that the witnesses' experiences were less material than assumed. This discovery opens the possibility of hallucination, but it does not prove it. I'm not that naive. However, if I were to argue that the witnesses' experiences with the plates were hallucinatory, I would base that argument on the lack of historical verification for the Book of Mormon. No real Nephites, no real plates, therefore the witnesses hallucinated. If one concludes the Book of Mormon is not historical which, given the state of our evidence at the moment is the most reasonable conclusion, then it is also reasonable to conclude the witnesses hallucinated. Unlike other religious traditions, Mormonism is vulnerable to this kind of critique. In the final analysis, Goff contributes nothing towards the historical question raised in my essay regarding the nature of the Book of Mormon witnesses' experiences. Were the experiences of the three and eight witnesses based on subjective experiences rather than the objective presence of an angel or the uncovered plates? Because he does not engage the arguments of either side of the debate and fails to consider the evidence and sources, Goff's esoteric discussion on the nature of reality is irrelevant and a red herring. 1. Dan Vogel, “The Validity of the Witnesses' Testimonies,” in American Apocrypha: Essays on the Book of Mormon, ed. Dan Vogel and Brent Lee Metcalfe (Salt Lake City: Signature Books, 2002), 79-121. I also discuss my assessment of the Book of Mormon witnesses in Early Mormon Documents (Salt Lake City: Signature Books, 1996-2003), 2:254-58, 3:464-72; 5:9-11, 345-47 (hereafter cited as EMD); and Joseph Smith: The Making of a Prophet (Salt Lake City: Signature Books, 2002), 443-50, 466-69. 2. Richard L. Anderson, Review of Lyndon W. Cook, David Whitmer Interviews, in Journal of Mormon History 20 (Spring 1994): 188. 3. Richard L. Anderson, “Attempts to Redefine the Experience of the Eight Witnesses,” Journal of Book of Mormon Studies 14/1 (2005): 18-31, 125-27. 4. Grant H. Palmer, “Witnesses to the Golden Plates,” chap. 6 of An Insider's View of Mormon Origins (Salt Lake City: Signature Books, 2002), 175-213. Palmer's views about the experiences of the witnesses are similar to mine, although I regard his suggestion that the eight witnesses “handled the plates in vision” as unlikely (206). I favor the view that the witnesses' experience was aided by a set of fake plates concealed under a cloth that were physically felt but spiritually seen. Palmer also suggests that Smith may have made “a plate-like object to persuade belief” (207), although he does not combine this with the experience of the eight witnesses. 5. For a discussion and sources of this, see below. Note that I am not making an assessment about the reality of visionary experiences. At this point, I'm merely attempting to establish the nature of what the witnesses experienced and contrast that with the claims of some apologists. 6. Anderson, “Attempts to Redefine,” 20. 7. Anderson, “Attempts to Redefine,” 125, n. 10. Anderson's source for this comment is David B. Dille, “Additional Testimony of Martin Harris (One of the Three Witnesses) to the Coming Forth of the Book of Mormon,” Millennial Star 21 (20 August 1859): 545-55 (EMD 2:297), who quoted Harris saying: “did I not at one time hold the plates on my knee an hour-and-a-half, whilst in conversation with Joseph, when we went to bury them in the woods, that the enemy might not obtain them? Yes, I did. And as many of the plates as Joseph Smith translated I handled with my hands, plate after plate.” The similarity between this reported statement and the Testimony of Eight Witnesses may be due to Dille's incorrect assumption that Harris saw the plates uncovered and the time-lapse between his interview with Harris and recording it on 15 September 1853, after his arrival in England (see EMD 2:297-98, n. 2). 8. Anderson, “Attempts to Redefine,” 20. 9. Richard Lloyd Anderson, Investigating the Book of Mormon Witnesses (Salt Lake City: Deseret Book Company, 1981). 10. Anderson, “Attempts to Redefine,” 20. 11. Palmer, Insider's View, 206. 12. Anderson, “Attempts to Redefine,” 126, n. 13. 14. Anderson, “Attempts to Redefine,” 21. 16. Stephen Burnett to Lyman E. Johnson, 15 April 1838, Joseph Smith Letterbook (1837-43), 2:64-66, Joseph Smith Papers, LDS Church History Library, Salt Lake City (EMD 2:292). Harris told John A. Clark that he saw the plates “with the eye of faith … just as distinctly as I see any thing around me,—though at the time they were covered over with a cloth” (John A. Clark, Letter to Dear Brethren, 31 August 1840, The Episcopal Recorder [Philadelphia] 18 [12 September 1840]: 99 [EMD 2:270]). This is probably what Harris told David B. Dille in 1859, though Dille omitted the cloth and echoed the wording of the Testimony of Eight Witnesses: “did I not at one time hold the plates on my knee an hour-and-a-half, whilst in conversation with Joseph, when we went to bury them in the woods, that the enemy might not obtain them? Yes, I did. And as many of the plates as Joseph Smith translated I handled with my hands, plate after plate” (“Additional Testimony of Martin Harris …,” Millennial Star 21 [20 August 1859]: 545-55 [EMD 2:297]). 17. Anderson, “Attempts to Redefine,” 21. 18. Lucy Smith, “Preliminary Manuscript,” 104, LDS Church History Library, Salt Lake City (EMD 1:396). 19. Anderson, “Attempts to Redefine,” 22; emphasis added. 20. Anderson, “Attempts to Redefine,” 22. 21. Thomas Ford, A History of Illinois, from Its Commencement As a State in 1818 to 1847 (Chicago: S. C. Griggs and Co., 1854), 258 (EMD 3:333). 22. Vogel, “Validity,” 103. See Fawn M. Brodie, No Man Knows My History: The Life of Joseph Smith the Mormon Prophet (New York: Alfred A. Knopf, 1945), 79-80. 24. Anderson, “Attempts to Redefine,” 22. 26. Theodore Turley, Memoranda, -, Joseph Smith History Documents, Bx 1, fd 15, LDS Church History Library, Salt Lake City. Handwriting of Thomas Bullock; interlinear insertions (enclosed in angled brackets) by Willard Richards. Apparently dates to 28 February 1845, when Bullock recorded in Church Historian's Office journal: “Turley in office all afternoon relating the difficulties in Missouri” (2:9; cf. 1:30.) Cf. DHC 3:307-8. 28. Palmer, Insider's View, 205-6. 29. Anderson, “Attempts to Redefine,” 23. 31. “A Visit to John Whitmer,” Deseret Evening News 8 (12 April 1875): 3; rept. Deseret News 24 (14 April 1875): 13. 32. Anderson, “Attempts to Redefine,” 23. 33. According to historian David Hackett Fischer, “The fallacy of proof by analogy is a functional form of error, which violates a cardinal rule of analogical inference—analogy is a useful tool of historical understanding only as an auxiliary to proof. It is never a substitute for it, however great the temptation may be or however difficult the empirical task at hand may seem” (Historian's Fallacies: Toward a Logic of Historical Thought [New York: Harper and Row, 1970], 255). 34. Manuscript History, Book C-1, 913, LDS Church History Library, Salt Lake City. 35. Minutes, Review of Book C-1, 29 July-11 Nov. 1845, Located inside back cover of Book C-1, LDS Church History Library, Salt Lake City. Handwritings of Willard Richards, Thomas Bullock, Franklin D. Richards, and Wilmer Benson. 36. Bruce N. Westergren, From Historian to Dissident: The Book of John Whitmer (Salt Lake City: Signature Books, 1995), 56. 37. Anderson, “Attempts to Redefine,” 23. 38. Stephen Burnett to Lyman E. Johnson, 15 April 1838, Joseph Smith Letterbook (1837-43), 2:64, 65, Joseph Smith Papers, LDS Church History Library (EMD 2:291, 292-93). 39. Ibid., 64 (EMD 2:291). 40. Warren Parrish to E. Holmes, 11 August 1838, in Evangelist (Carthage, OH) 6 (1 October 1838): 226. Parrish supplies the scriptural reference alluded to by Harris: the revelation dictated by Joseph Smith in June 1829 that promised the three hopeful witnesses a view of the plates if their faith was strong and instructed them to testify to the world that they saw the plates “even as my servant Joseph Smith, Jun., has seen them; for it is by my power that he has seen them, and it is because he had faith” (D&C 17:5). 41. Anderson, “Attempts to Redefine,” 24. 42. Ezra Booth to Reverend Ira Eddy, 24 October 1831, “Mormonism—No. III,” Ohio Star (Ravenna, OH) 2 (27 October 1831): 3; rept. in E. D. Howe, Mormonism Unvailed (Painesville, OH: author, 1834), 186-87 (EMD 5:309). 44. Anderson, “Attempts to Redefine,” 24. 46. Ibid., 24-25. Quote is from Martin Harris to H. B. Emerson, January 1871, Saints' Herald 22 (15 October 1875): 630 (EMD 2:338). 47. John H. Gilbert, “Memorandum, made by John H. Gilbert Esq, Sept[ember]. 8th, 1892[,] Palmyra, N.Y.,” 5, Palmyra King's Daughters Free Library, Palmyra, NY (EMD 2:548). See also John H. Gilbert to James T. Cobb, 16 Mar. 1879, Theodore A. Schroeder Papers, Rare Books and Manuscripts Division, New York Public Library, New York, NY (EMD 2:526); “Mormon Leaders at Their Mecca,” New York Herald (25 June 1893): 12 (EMD 2:551). Pomeroy Tucker, who was foreman in Grandin's printing office, said Harris “used to practice a good deal of his characteristic jargon about ‘seeing with the spiritual eye,' and the like” (Pomeroy Tucker, Origin, Rise, and Progress of Mormonism [New York: D. Appleton and Co., 1867], 71). Palmyra Presbyterian minister Jesse Townsend reported that Harris claimed to have seen the plates with “spiritual eyes” (Jesse Townsend to Phineas Stiles, 24 December 1833, in Ibid., 290). When pressed about his vision, Harris also told John A. Clark: “I saw them with the eye of faith” (John A. Clark to Dear Brethren, 31 August 1840, Episcopal Recorder (Philadelphia) 18 (12 September 1840): 98 (EMD 2:270). 48. Stephen Burnett to Lyman E. Johnson, 15 April 1838, 65 (EMD 2:292-93). 49. Anderson, “Attempts to Redefine,” 25; emphasis added. 51. Anderson, “Attempts to Redefine,” 24. 52. Stephen Burnett to Lyman E. Johnson, 15 April 1838, 64 (EMD 2:291). 53. Anderson, “Attempts to Redefine,” 24. 56. John A. Clark, Letter to Dear Brethren, 31 August 1840, The Episcopal Recorder [Philadelphia] 18 (12 September 1840): 99 (EMD 2:270). 57. “Mormonism,” Susquehanna Register 9 (1 May 1834): 1 (EMD 4:286). 58. Book of Commandments 4:1; cf. D&C 5:1. 59. “Mormonism,” Susquehanna Register 9 (1 May 1834): 1 (EMD 4:286-87). 60. Anderson, “Attempts to Redefine,” 25. 65. John Whitmer, “Address,” Latter Day Saints' Messenger and Advocate 2 (March 1836): 286-87 (EMD 5:239). 67. Anderson, “Attempts to Redefine,” 27. 69. Anderson, “Attempts to Redefine,” 27. “Report of Elders Orson Pratt and Joseph F. Smith,” Deseret News, 16 November 1878; reprinted in the Millennial Star 40 (9 December 1878): 771-74 (EMD 5:50). 70. Sally Parker to John Kempton, 26 August 1838, microfilm, Family History Library, The Church of Jesus Christ of Latter-day Saints, Salt Lake City, microfilm no. 840025. 71. Nathan Tanner, Jr., to Nathan A. Tanner, 17 February 1909, LDS Church History Library (EMD 5:170). After his interview with Whitmer, Tanner recorded in his journal: “He then explained that he saw the plates and with his natural eyes, but he had to be prepared for it—that he and the other witnesses were overshadowed by the power of God and a halo of brightness indescribable” (Nathan Tanner, Jr., Journal, 13 May 1886, [54-55], LDS Church History Library [EMD 5:166]). 72. P. Wilhelm Poulson to Editors, 31 July 1878, Deseret Evening News, 6 August 1878 (EMD 5:248). 73. David Whitmer to S. T. Mouch, 18 Nov. 1882, Whitmer Collection, Community of Christ Library-Archives, Independence, MO (EMD 5:36). Anderson believes the recipient of the letter was “L. F. (or T.) Monch (or Mouch),” whom he identifies as probably Louis F. Moench, an Ogden educator. 74. P. Wilhelm Poulson to Editor, 13 August 1878, Deseret Evening News, 16 August 1878 (EMD 5:40). 75. Anderson, “Attempts to Redefine,” 27. 77. J. Smith, Manuscript History, Book A-1, 24-25 (EMD 1:84-85); cf. Joseph Smith, Jr., History of the Church of Jesus Christ of Latter-day Saints, ed. B. H. Roberts, 7 vols. (2nd ed. rev. ; Salt Lake City: Deseret Book, 1948 printing), 1:52-57; and “History of Joseph Smith,” Times and Seasons 3 (1 September 1842): 897-98. 78. Anderson, “Attempts to Redefine,” 28, 127 n. 62. 81. Anderson, AAttempts to Redefine,@ 28. 83. Joseph F. Smith, Diary, 7-8 September 1878, LDS Church History Library, Salt Lake City (EMD 5:44). 84. Anderson, “Attempts to Redefine,” 30. 85. Ibid., 31; emphasis added. 87. Ibid. Quoting Palmer, Insider's View, 204, and Vogel, “Validity,” 97. 88. To Joel Tiffany's question, “How did the Lord show you these things?” Harris replied, “I am forbidden to say anything how the Lord showed them to me, except that by the power of God I have seen them” (“Mormonism—No. II,” Tiffany's Monthly 5 [August 1859]: 166; EMD 2:306). 89. Anderson, “Attempts to Redefine,” 31. 91. Steven C. Harper, “Evaluating the Book of Mormon Witnesses,” Religious Educator 11/2 (2010): 37. 96. Louis Gottschalk, Understanding History: A Primer of Historical Method, 2nd ed. (New York: Alfred A. Knopf, 1969), 165. 97. See, for example, Richard Lyman Bushman, Joseph Smith: Rough Stone Rolling(New York: Alfred A. Knopf, 2005), 78. 98. “Mormonism,” Susquehanna Register, and Northern Pennsylvanian 9 (1 May 1834): 1 (EMD 4:286). 99. “Mormonism—No. II,” Tiffany's Monthly 5 (August 1859): 167; (EMD 2:307). 100. Joseph Smith III, “Last Testimony of Sister Emma,” Saints' Herald 26 (1 October 1879): 290 (EMD 1:541). 101. William Smith, William Smith on Mormonism (Lamoni, IA: Herald Steam Book and Job Office, 1883), 12 (EMD 1:497). 102. “Mormonism—No. II,” 166 (EMD 2:306). 104. Vogel, Joseph Smith, 98. 105. Ibid., 600, n. 65. See also Vogel, “Validity,” 120-21, n. 134. 106. Daniel C. Peterson, “Editor's Introduction—‘In the Hope that Something Will Stick': Changing Explanations for the Book of Mormon,” FARMS Review 16/2 (2004): xxviii. 107. Ibid., xxxi, nn. 66 and 67. 108. Lucy Smith, “Preliminary Manuscript,” 61-62, LDS Church History Library, Salt Lake City (EMD 1:328-29); Lucy Smith, Biographical Sketches of Joseph Smith the Prophet, and His Progenitors for many Generations (Liverpool: S. W. Richards, 1853), 107 (EMD 1:339). 109. Daniel C. Peterson, “Editor's Introduction—Not So Easily Dismissed: Some Facts for Which Counterexplanations of the Book of Mormon Will Need to Account,” FARMS Review 17/2 (2005): xlii-xliii. 112. Richard Lyman Bushman, Joseph Smith: Rough Stone Rolling (New York: Alfred A. Knopf, 2005), 58. 113. Alan Goff, “Positivism and the Priority of Ideology in Mosiah-First Theories of Book of Mormon Production,” FARMS Review 16/1 (2004): 20. 116. “Since the vision of the three witnesses can be classified as a mystical experience, the subject of hallucination cannot be ignored” (Ibid., 90); “While one might feel confident about visions experienced by multiple witnesses, such a phenomenon does not automatically rule out the possibility of hallucination” (Ibid., 105). 119. Elsewhere I have said: “No biographer is completely free of bias. As is no doubt apparent, my inclination is to interpret any claim of the paranormal—precognition, clairvoyance, telekinesis, telepathy—as delusion or fraud. I do not claim that the supernatural does not exist, for it is impossible to prove a negative. I maintain only that the evidence upon which such claims rest is unconvincing to me” (Joseph Smith: The Making of a Prophet (Salt Lake City: Signature Books, 2004), xii.